Taught by Ed Kehoe, Kehoe Martial Arts offers a variety of classes to fit your experience and comfort levels. Offerings vary in size, difficulty, length, and commitment. Ed Kehoe also shares his expertise at national workshops. In all offerings, Ed strives to highlight stress relieving practices and enable his students to identify and process forces of tension and negativity before they negatively affect an individual’s physical and mental well-being. Ed views stress as a force that must be dealt with rather than ignored. Learning how to yield to and redirect an incoming force equips students to better manage and recover from the negative effects of stress. 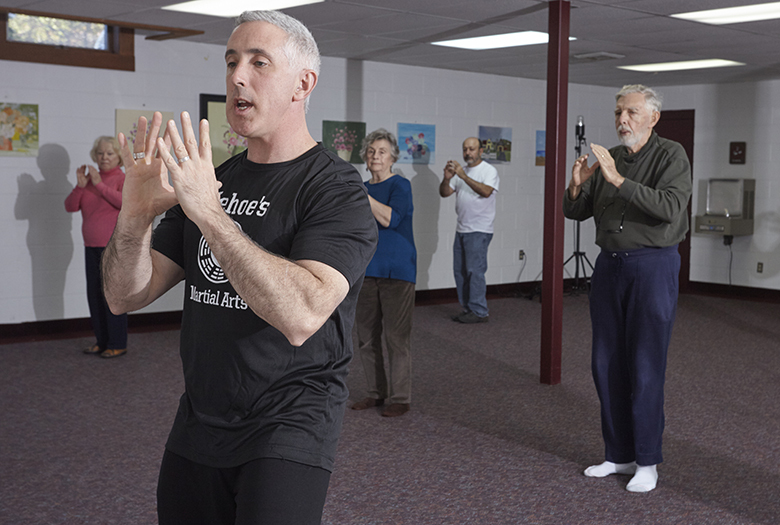 Ed Kehoe recommends wearing comfortable clothing that will not restrict movement when practicing Tai Chi and Qigong. Footwear is also important; be sure to wear flat soled shoes that you feel steady and comfortable moving around in. Rest assured, these classes are non-strenuous, yet effective. Students do not require a shower afterwards. Visit the calendar to find a class to attend near you or contact Ed Kehoe to schedule a corporate or group class.